India announced Rs 4,500 crore financial assistance to Bhutan for its 12th five-year plan. Indian assistance will account for 15% of the outlay for the five-year-plan, which is the lowest proportion ever. India also contributed Rs 4,500 core for the 11th five-year plan, but it accounted for 23% of the smaller outlay. ISRO will complete building a ground station in Bhutan for the South Asian Satellite that will help the Himalayan nation in weather information, tele-medicine and disaster relief in the far-flung areas. The Bhutanese PM is on a three-day visit to India. It is his first foreign visit after taking charge as PM of the Himalayan nation last month. Modi, too, had chosen Bhutan to be his first foreign port of call after being elected India’s Prime Minister in 2014. Diplomatic relations between India and Bhutan were established in 1968, and the basic framework of India- Bhutan bilateral relations was the Treaty of Friendship and Cooperation signed in 1949 between the two countries, which was revised in February 2007. The India-Bhutan Friendship Treaty not only reflects the contemporary nature of our relationship but also lays the foundation for their future development in the 21st century. The Golden Jubilee of the establishment of formal diplomatic relations between India and Bhutan is being celebrated in the year 2018. The India-Bhutan relationship is often characterised by the grants and aid that India has extended to the small country, principally to the hydropower plants that provide Bhutan its largest single source of revenue. The political relationship, though, precedes the hydropower projects by decades, and is best seen in the context of Tibetan issues. After India gained independence, Bhutan was one of the first countries to reach out to the new India. Formal bilateral relations between Bhutan and India were established in January 1968 with the appointment of a special officer of the Government of India to Bhutan. The basis for bilateral relations between India and Bhutan is formed by the Indo-Bhutan Treaty of 1949. On August 8, 1949 Bhutan and India signed the Treaty of Friendship, calling for peace between the two nations and non-interference in each other’s internal affairs. However, Bhutan agreed to let India “guide” its foreign policy and decided that both nations would consult each other closely on foreign and defence affairs. The treaty also established free trade and extradition protocols. The treaty of 1949 between India and Bhutan was updated in 2007. The most significant change was in Article 2. On its part, the Government of Bhutan agrees to be guided by the advice of the Government of India in regard to its external relations. The point that had provoked some amount of criticism or controversy pertains to the second part of this Article since it tries to qualify Bhutan’s external relations. Bhutan’s significance to India stems from its geographic location. Nestled in the Himalayas, it is sandwiched between India and China. Thus, it serves as a buffer between the two Asian giants. Bhutan’s value as a buffer soared after China annexed Tibet in 1951. As the 2017 crisis in the Doklam region revealed, India will strongly oppose, even militarily, any Chinese attempt to assert control over mDoklam. Securing Bhutan’s present borders especially its western border is clearly important for India. 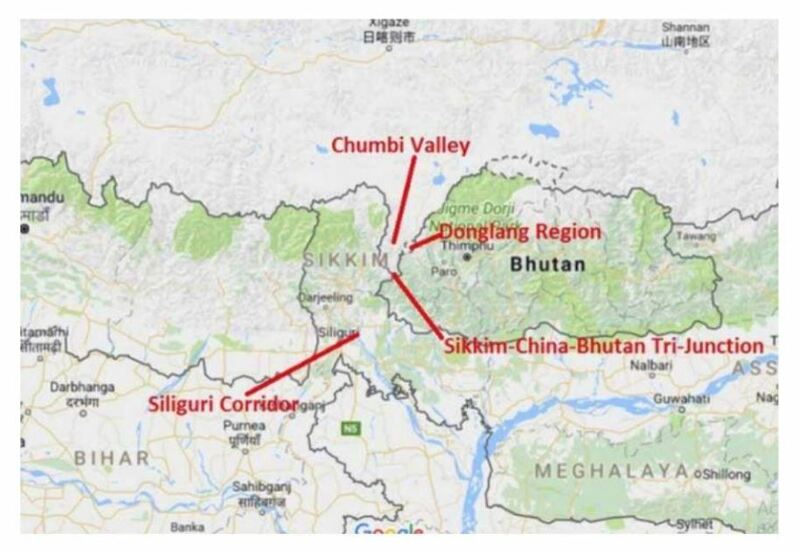 Doklam in the hands of a hostile power would heighten the vulnerability of India’s Siliguri Corridor, a narrow strip of land that links India to its Northeastern states. So vital is Doklam to India’s defence that India has a permanent and sizeable military contingent and an army hospital in Haa district, where Doklam is located. India dominates Bhutan’s economy. It is Bhutan’s largest trade partner; around 79% of Bhutan’s total imports are from India and India provides a market for 90% of its exports. Additionally, India is Bhutan’s largest aid donor. Between 2000 and 2017, Bhutan received $4.7 billion in aid from India, the lion’s share of India’s total foreign aid. Bhutan is a strategically important country for India due to its location, and both sides have been ramping up overall cooperation, including in areas of defence and security, and energy, over the past a few years. India’s Border Roads Organisation has completed construction of a strategically key road in Bhutan, linking the neighbouring country’s border town of Phuentshogling with its capital city of Thimphu. This development, instead of being seen as a deviation from the norm, presents an enormous opportunity for India to seize the moment and graduate from being Bhutan’s largest developmental partner to Bhutan’s largest investor and business partner.